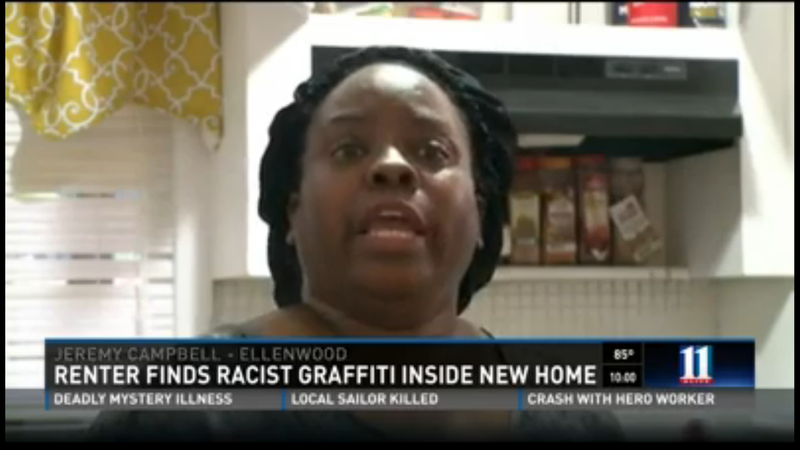 Jennie McNair, who recently relocated her family from Tampa to Ellenwood, Georgia, was shocked to find her new home vandalized with racist graffiti before they'd even finished moving in their belongings. "We were just trying to get a fresh start in life," said McNair of the move. Upon moving in the last of their things the family was horrified to find racial slurs, insults, and swastikas covering the walls. "It's basically destroyed," she said. "Everything." McNair does not know anyone in the area and has no idea who could have perpetrated such a heinous act. Although renter's insurance will help to replace some of what the family has lost, McNair says she's traumatized by the incident and will be moving back to Florida. "Me and my kids are basically homeless," she said. "We don't really know where to start."